Really, Seriously!?! New Hampshire Wants to Keep Its First in the Nation Primary Status? Well, that's news to FHQ. Have they done this before? Actually, this is a post (at least in part) that FHQ put together last January when the General Court in New Hampshire was tweaking the election law regarding the timing of its presidential primary. It has been sitting in the queue for a year for some reason; probably because it perfectly proves the point that the "warning" that the Granite state will protect its position really is not all that newsworthy. Well, it is (...around these parts). And The Union Leader's John DiStaso is absolutely right in saying that New Hampshirites on the Democratic Change Commission and on the Rules and Bylaws Committee were awfully quiet when it came time to vote on the delegate selection rules for 2012. They knew the proposed four day window between New Hampshire and Nevada would be in violation of the state law. In my own personal experience at the Change Commission's May meeting, Ray Buckley, chair of the New Hampshire Democratic Party and committeeman, uttered nary a word about this conflict. FHQ remains neutral in these things (the pros and cons of New Hampshire's privileged position -- Hey, I just research this stuff. ), but one would have to see right off that the powers-that-be in the Granite state would stand up to defend their turf as they see it. If they allow the law's enforcement to be fudged in any way, the state becomes vulnerable to challenges in future presidential nomination cycles. That said, New Hampshire did let the law enforcement slide somewhat in 2008. That seven day window applies on either side of the primary in New Hampshire -- before and after. 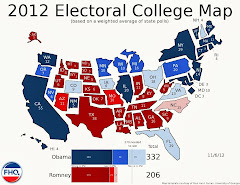 Given how Iowa and New Hampshire decided to adhere to the unwritten rule that no contest should take place outside of the election year, both contests ended up compressed in a six day period between January 3 and January 8, 2008. [Notice that no one is mentioning the Wyoming Republican caucuses on January 5, still.] This was likely the motivation for the law change last January (described below in the text from the unpublished post); to codify an exemption for Iowa. In other words, there is some room for ex post facto maneuvering. ...but it is dangerous (from the perspective of the Granite state) and New Hampshire will never do anything to jeopardize its position. The key in all of this is that New Hampshire secretary of state, Bill Gardner holds all the power. The state is able to avoid any partisan squabbles in the General Court because the decision on the timing of the primary bypasses the legislature altogether and is in the secretary of state's hands. New Hampshire is much better equipped to move at the last minute than any other state. CONCORD, N.H. (AP) — New Hampshire lawmakers hope to end any doubt about the state's intent to continue holding the first presidential primary. The state House is voting Wednesday on whether to give the secretary of state wider latitude in setting the primary date. That would help protect the state's tradition of being first. State Rep. Jim Splaine is sponsoring the bill. The measure will go to the Senate if the House approves it and is widely expected to become law. Maddeningly limited in the scope of its information, isn't it? The details of the changes in Rep. Jim Splaine's bill (HB 341) before the New Hampshire House of Representatives are below. As it is under current law, the New Hampshire secretary of state has the ability to set the date of the Granite state's presidential primary, and that law requires that the primary be at least a week before any other similar contest. The bottom line is that when the legislature makes a change to the law concerning the presidential primary, it is typically couched in terms of 1) a change in the duties of the secretary of state on the matter and 2) to protect the state's position in the nomination process. And that's what they've done with the law below. "Presidential Primary Election. The presidential primary election shall be held on the second Tuesday in March or on a date selected by the secretary of state which is 7 days or more immediately preceding the date on which any other state shall hold a similar election whichever is earlier, of each year when a president of the United States is to be elected or the year previous. Said primary shall be held in connection with the regular March town meeting or election or, if held on any other day, at a special election called by the secretary of state for that purpose." "Presidential Primary Election. The presidential primary election shall be held on the second Tuesday in March or on a date selected by the secretary of state which is 7 days or more immediately preceding the date on which any other state shall hold a similar election, or holds a caucus or in the interpretation of the secretary of state holds any contest at which delegates are chosen for the national conventions, whichever is earlier, of each year when a president of the United States is to be elected or the year previous. Said primary shall be held in connection with the regular March town meeting or election or, if held on any other day, at a special election called by the secretary of state for that purpose. Any caucus of a state first held before 1975 shall not be affected by this provision." Protection from interloping caucuses? Check. Caucus states are italicized while primary states are not. Several caucus states are missing from the list because they have not formalized the date on which their contests will be held in 2012. Colorado appears because the caucuses dates there are set by the state, whereas a state like Alaska has caucuses run by the state parties and as such do not have their dates codified in state law. States that have changed dates appear twice (or more) on the calendar; once by the old date and once by the new date. The old date will be struck through while the new date will be color-coded with the amount of movement (in days) in parentheses. States in green are states that have moved to earlier dates on the calendar and states in red are those that have moved to later dates. Arkansas, for example, has moved its 2012 primary and moved it back 104 days from its 2008 position. *New Hampshire law calls for the Granite state to hold a primary on the second Tuesday of March or seven days prior to any other similar election, whichever is earlier. Florida is first now, so New Hampshire would be a week earlier at the latest. Traditionally, Iowa has gone on the Monday a week prior to New Hampshire. For the time being we'll wedge South Carolina in on the Saturday between New Hampshire and Florida, but these are just guesses at the moment. Any rogue states could cause a shift. 1. Since the Nevada caucuses on both sides of the aisle are given a privileged position -- ahead of the window in which all non-exempt states can hold delegate selection events -- it is more difficult to tabulate how much change there was/will be between the state's 2008 and 2012 positions. This is also true because the state parties are setting caucus dates and are not subject to laws as in primary states where the date is set in stone. In other words, they have a bit more freedom to choose the dates of their contests. What appears above for Nevada assumes that if the GOP had not chosen the February 18, 2012 date in their meeting last week, the state would have continued to hold mid-January caucus meetings (the third Saturday in January to be precise). As such, the Nevada GOP dropped back by four weeks. 2. There are still 18 non-exempt states (between Florida and Arizona/Michigan on the calendar above) that will have to shift the dates on which their primaries are held to come into compliance with the both national parties' sets of rules governing delegate selection. 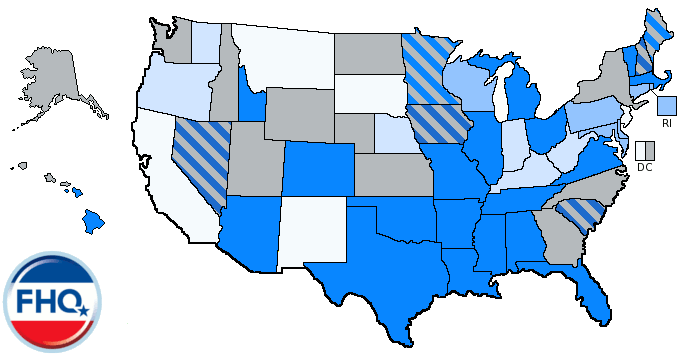 These states continue to be the ones to watch once state legislatures convene in early 2011. 3. You can read more on the potential calendar movement in Molly Ball's article at Politico. You might even see a comment or two from yours truly in there somewhere. "The Nevada Republican Executive Committee voted Wednesday to hold the party's 2012 presidential caucus on February 18, a decision that could make GOP voters in the "First in the West" state third in line to vote for their party's next nominee." The February 18, 2012 date for the Republican caucuses in the Silver state is aligned with where the Democratic Rules and Bylaws Committee had Nevada slated on their calendar for the Democratic nomination. I'm less surprised by the setting of the date than I am by the timing of it all. The Nevada Republican Party is not taking the wait-and-see approach that Iowa and New Hampshire (or even South Carolina Republicans) typically take for setting the dates on which their delegate selection events are held. Those states let all the other states that are going to move make their moves and then react. For various reasons -- the state parties, not state legislatures, control the date setting power in Iowa and South Carolina and the New Hampshire secretary of state holds that power in the Granite state -- those earliest of states are better able to move than other states. Of course, it helps to get an exemption from the national parties as well. The Nevada Republican Party is acting as if it does not have that privilege by setting their caucuses date this early in the 2012 cycle. There is precedence for this, however. Nevada Republicans moved their first round contests to February 2008 (basically where they were in 2004) in March 2007, but quickly changed that a month later to align their contest with the January 19 timing of the Nevada Democratic caucuses. Again, without having to filter this date-setting decision through the state government -- state legislature and governor -- state parties have much more leeway to shift the dates on which their, typically, caucuses are held. They can revisit the date with much more freedom than the state governmental apparatus. That isn't to say that Nevada will or won't move again ahead of 2012, but until some other states, especially those eighteen February states* that have to change their state laws to come into compliance with the new national party rules, make a move, an asterisk should be placed next to Nevada for now. FHQ will use pencil for the moment. Once the state legislatures begin convening next and start addressing this issue, we can maybe shift to chiseling it into stone for 2012. *That count includes one primary currently scheduled for January, Florida. On Republican "Sticks" and Democratic "Carrots"
I'm going to run the risk of heaping it on George Will, but something he said in his Sunday column begged for a response. Any Republican delegate-selection event held before the first day of April shall be penalized: The result cannot be, as many Republicans prefer, a winner-take-all allocation of delegates. March events "shall provide for the allocation of delegates on a proportional basis." This means only that someof the delegates must be allocated proportional to the total vote. Because Democrats are severe democrats, they have no winner-take-all events, so they do not have this stick with which to discipline disobedient states. Instead, they brandish -- they are, after all, liberals -- a carrot: States will be offered bonus delegates for moving their nominating events deeper into the nominating season, and for clustering their contests with those of neighboring states. States, in the end, are self interested. They want influence over the identity of the presidential nominee. And that is a goal that is, depending on the angle, at odds with what the national parties want. In other words, the national parties end up with what they don't want: a nominee who is initially unelectable or becomes unelectable because of a divisive nomination decision. I just don't see how the states are penalized by the change to proportional delegate allocation. One other point on the above excerpt: Will deftly employs some revisionist history in discussing the Democrats' "carrots". He fails to mention that the bonus delegate regime began across the aisle with the Republicans at their 1996 national convention in San Diego. It was there that the GOP put in place a bonus delegate system for the 2000 Republican nomination. Will also fails to recognize the "sticks" the Democratic Party utilized in 2008 and has carried over to the 2012 cycle. Sure, states under the Democratic rules, as is the case under the Republican rules, lose half their allotment of delegates, but they also call for candidates who campaign in violating states -- those that go too early -- to lose their delegates from that state at the national convention (Rule 20.C.1.b from the 2008 and 2012 Democratic Delegate Selection Rules). In theory at least, that rule would have had more bite in 2012 if the Democrats had not flip-flopped and then flipped again twice on how to deal with Florida and Michigan. That muddled implementation of the rules may end up hurting both parties in 2012, but the Republicans more since theirs will be the only contested nomination. What I mean is that states will be more likely to test the Republican rules because of the Democrats' actions in 2008. The Republican Party still has the half delegation penalty plus the new proportionality requirement as penalties to rule-breaking states. FHQ is still skeptical as to whether that will be an effective rule in curbing state frontloading. If a short history of presidential primaries is going to be constructed, it would at least be helpful to include a full and accurate account of the most recent events that will more greatly affect the next nomination cycle. *Of course, that assumes that the Tea Party faction is a lasting one that faces no backlash following the 2010 midterms or before the 2012 nomination race kicks off in earnest. A short history of presidential primaries meets reality. There must have been a lull of sorts reached in this midterm election cycle yesterday because it had Washington Post opinion columnist, George Will, gazing off into the future, but not without a tip of the cap to the past ["A short history of presidential primaries."]. The truth is that FHQ just didn't care too much for Will's history lesson. Well, actually the history part wasn't all that bad. 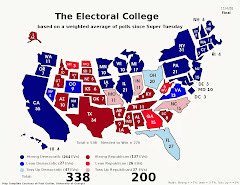 The story of the intent of the Founders in creating the Electoral College is one I always like telling my Intro to American Government classes. However, the esteemed conservative columnist is guilty of not only omitting some important information from the recent past of presidential primaries but also of making a fairly large assumption in regard to the 2012 nomination process. Let me address the latter first. I will be among the first in line (and was) to commend the parties for their ad hoc coordination of the two sets of rules governing presidential nominations for the 2012 cycle. [The intra-party groups -- the GOP Temporary Delegate Selection Committee and the Democratic Change Commission -- were not ad hoc, but the inter-party efforts were.] FHQ said soon after the 2008 cycle was complete that the parties working together was a necessary, if not sufficient, way of reigning in the frontloading that has "plagued" the process essentially since it was reformed during the 1968 nomination process. But the national parties merely changing their rules for presidential selection is but one piece to this puzzle. There is a whole process that will begin playing out as soon as the midterm elections are over in November. Once the newly elected state legislatures begin sessions in early 2011 by filing -- or not filing -- bills to change the election laws of states across the country, we'll begin to understand whether this will be a harmonious process or not. 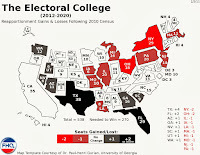 While the GOP may have their "sticks" and the Democrats their "carrots", eighteen states must still alter their election laws to shift their primaries to later dates and thus back into compliance with the national parties' presidential selection rules. FHQ will not say that this is impossible. * We will, however, point out that those eighteen states represent eighteen opportunities for shirking. That shirking, in turn, poses a threat to an unraveling of the whole process. And yes, Iowa, New Hampshire, Nevada and South Carolina will sit on the sidelines and wait as other states act -- or don't act. Those "Entitled Four" will bide their time and shift the dates on which their contests occur accordingly; earlier than everyone else. Will really need look no further than Florida and Michigan in 2008 for examples of this. Actually, it is fundamentally irresponsible for him to have omitted the two violators from the last cycle from his column. The Florida and Michigan examples hold the key to the 2012 process. States will either follow the rules as most have throughout the post-McGovern-Fraser reform era or they will treat Florida and Michigan in 2008 as a sea change; a states' rights sea change. States' rights is a loaded term in American political history, but in this case, it is appropriate if only because the states will have the option to flex their muscles, if they so choose, against the national parties' sanctions. As I have argued, the states have the incentive to balk at the rules simply because the penalties are not strong enough. I guess we'll start finding out in January when the newly elected state legislatures convene in state capitals across the nation. *It should be noted that Arkansas as well as Illinois and Montana Republicans have moved their contests for 2012 back already. Has something been missed here? This simultaneous rally idea that Jon Stewart and Stephen Colbert have hatched seems at best oddly timed and at worst counterproductive. In the case of the former, the "Rally to Restore Sanity" and "March to Keep Fear Alive" are scheduled for the weekend before the November 2 midterm elections. Yeah, that's almost as coincidental as Glenn Beck holding a Rally to Restore Honor on the same day and at the same location as Martin Luther King Jr.'s "I have a dream" speech. Coincident or not, Stewart and Colbert are appealing to moderates, but are more likely to energize liberals and Democrats on a weekend that those people would probably be better served volunteering their time going door to door to turn out "on the fence" Democratic voters who might help cushion what looks to be a fairly significant blow to the Democratic majorities in both houses of Congress. Again, the timing seems odd whether you hold the view that the two Comedy Central late night personalities are Democrats at heart, or like I tell my classes I try to be, equal opportunity offenders. Pence is the real surprise here. If you were going to pick a Hoosier to have a good shot at the Republican nomination, you might have opted for Mitch Daniels instead of Pence. Yet, there Pence is, having doubled his share of the vote from last year's straw poll, on top. Sure Sarah Palin is on the low end in terms of share of the vote, but she was not in attendance. Neither was Tim Pawlenty, who pulled his name off the ballot because he wasn't going to be there. The Minnesota governor was in a similar position to Pence a year ago and there is no telling how he would have fared this year. Finally, Mike Huckabee and Mitt Romney essentially maintained similar shares of the straw poll vote as they did in 2009. Does this result prompt Pence to jump in? Well, it is a little early still, but it might give him something to think about. Once the calendar turns to 2011, we will start seeing Republicans line up to throw their hat in the ring for the nomination. That's the next step. Will the Tea Party Pull Extend to the 2012 GOP Nomination? The back and forth this morning concerning the long-term impact of Christine O'Donnell's primary victory in Delaware last night has been interesting to say the least. First of all, I don't think we know the long-term effect of her victory or those of other Tea Party-backed candidates during the 2010 primary season. Talk coming out of the 2008 election was that the Republican Party had a choice in the face of such a sweeping defeat: 1) shift to the right in an effort to purify the party or 2) take the pragmatic route and just win, baby. Last night's results were a microcosm of that battle. A moderate, electable, yet not terribly popular candidate (Mike Castle) lost to a more ideologically, if not extreme, candidate (O'Donnell). But will this rightward shift in some primary races in 2010 extend to the battle for the Republican presidential nomination race in 2012? First Read answers with the question with an absolute: "One thing is certainly clear, however: This temporary evolution within the Republican Party will end up pushing the 2012 GOP presidential field more to the right." Joe Scarborough finds a surge and decline type of pattern in past midterm to GOP nomination elections. In other words, a rightward, corrective shift in the midterms will yield a more establishmentarian two years down the road in a presidential nomination race. Hmmm. Which one is right? In FHQ's mind, neither. Scarborough cites the 1966 Republican Revolution followed by the nomination and subsequent election of Richard Nixon and the 1994 Contract with America wave and the 1996 nomination of Bob Dole as examples. Well, 1966/68 is not particularly applicable since it occurred prior to the McGovern-Fraser reforms that reshaped how presidential nominees were (and are) chosen. Primary and caucus results were not binding on the nomination decision made later at the convention. To say, then, that an establishment candidate was chosen is a no-brainer. Of course an establishment candidate was chosen. The establishment chose them; in this case, Richard Nixon. That leave us with the 1994/96 example. Even if we could count 1966/68, we're talking about just two data points and that just isn't often going to yield anything conclusive. It is all we have, but it isn't necessarily a representative sample. In fact, the odds are that those two examples are not representative at all. But let's focus on 1994/96, but let's take a micro view of the context of those two elections instead of the macro brush Scarborough is painting this with. If we follow the surge and decline theory that 1992 and Clinton's victory brought with it a series of Democratic victories that otherwise wouldn't have been in Congress, then 1994 was a huge, rightward correction to that shift. But was 1996 and the Republican nomination of Bob Dole that year an example of a correction to that "overreach"? Possibly, but how could that be measured? One way to look at that race is by looking at the field of candidates. Gingrich was the face of 1994 and there really was not a Gingrich-type candidate who entered the race for the 1996 Republican presidential nomination. Pat Buchanan made some waves with some early primary victories and could stake some claim to the mantle of rightward shift representative, but to FHQ's recollection he was not a direct extension of Gingrich and the Contract Republicans he brought with him in 1994. The story of that race was that Dole outlasted both Buchanan and the self-funded effort Steve Forbes made. It had little to do with a battle for the soul of the Republican Party. There was no purist versus establishment battle in 1996, and if there was the establishment won a pyrrhic victory. Dole was so cash-strapped from winning the nomination race that he had no way to counter Clinton's efforts to define the Kansas senator and former majority leader over the summer. But was Dole an establishment counter to a purist overreach in 1994? I don't know that that is the conclusion to be reached. Given a limited field of candidates against a president on the rise after the 1995 government shutdown, Republican primary voters opted for their best chance to win. That just happened to be the next guy in line. All told, 1994/96 is 1994/96 and 2010/12 will likely hold some similarities, but also some differences. First Read takes things too far in terms of the likelihood of a shift to the right in the Republican nomination race. It should be said before I go any further that a lot of this talk hinges on the assumption that the 2012 environment will (closely?) resemble what we are witnessing in 2010. That obviously isn't necessarily the case. Much can change in two years. It wasn't all that long ago that some were speculating on the potential impact the Sonia Sotomayor nomination would have on Democratic chances in Texas (in the electoral college) in 2012. However, if we follow that assumption and 2010 manifests itself in the form of presidential candidates (Palin or Jim DeMint, for example) in 2012, then perhaps there is something to the theory of a rightward shift in the 2012 Republican nomination race. The impact is likely to be similar to 1994/96, but for different reasons. The end result -- a weakened nominee -- will be the same, but how Republicans get there will be slightly different. In that scenario, the fight would be between the grassroots and the establishment. Let's say that both factions quickly narrow their options down to one each. Let's say Palin and Romney for illustrative purposes. At that point, the reaction in some Republican circles will be that a competitive, two-person race is a good thing for the party in the same that Clinton and Obama yielded an energized base of Democrats in 2008. There is one major flaw in that premise though: While Clinton/Obama felt like a fight for the soul of the Democratic Party at times, the truth was that the two potential nominees were not all that fundamentally different. They weren't candidates from two different factions of the party so much as they were candidates who fared well with particular constituencies within the Democratic primary electorate. A Romney versus Palin or establishment versus grassroots battle for the 2012 Republican nomination is a different animal. That is a fight that potentially tips the balance of the race from beneficial due to competitiveness to detrimental because of divisiveness. In the end, will 2012 represent a correction or a continued shift to the right? The answer is somewhere in the middle of those two absolutes and much of it depends on the environment in 2010 extending to 2012. UPDATE: Of course now the establishment is jumping behind O'Donnell. Turnout always matters unless it doesn't. Last year, political scientists Stephen Ansolabehere and Charles Stewart pointed out that most of Barack Obama’s increased vote total over John Kerry came from black and Hispanic voters. Those two ethnic/racial groups together accounted for an increase of 7 million votes for Obama, as compared to 3 million added votes from non-Hispanic white citizens. So in thinking about the upcoming elections for the House of Representatives, it makes sense to ask about how blacks and Latinos are represented in the most competitive districts. Consider the 42 seats currently held by Democrats that analyst Charlie Cook considers to be “toss ups.” As these races go, so goes the House in all likelihood. According to the Census Bureau, the median toss-up district’sresidents in 2006-8 were 3.6% Latino and 4.8% black—as compared to shares of 15.1% and 12.3% nationally. Simply put, irrespective of turnout, the electorate that will prove decisive in which party controls the House has fewer voters of color than the electorate that proved decisive in electing Obama. Food for thought with just one more round of primaries between us and a full scale general election campaign. If you follow GOP12 at all -- and if you aren't now that the site is back up and running, you should -- this is not much of a revelation. However, both MSNBC's First Read and Political Wire (via AP) are talking about the former New Mexico governor this morning. The AP's Glover profiles former New Mexico Gov. Gary Johnson, who appears to be running for president. "Despite two terms as governor of New Mexico and recent visits to 26 states, most Americans have never heard of Gary Johnson. The former Republican governor is mulling a run for president, and his libertarian views and small government platform fit the disenchantment many voters feel toward Washington. Among his supporters is Texas Republican Rep. Ron Paul, who drew a committed following in his 2008 campaign for president and was quoted in the conservative online website The Daily Caller as saying if he didn't run again in 2012, the best candidate would be Johnson." Former New Mexico Gov. Gary Johnson (R) is exploring a presidential bid even though he knows most people have never heard of him, the AP reports. Said Johnson: "There are two courses of action. One would be to do nothing and the other would be to burn some shoe leather and see what happens. I'm burning some shoe leather." Johnson supports slashing government spending, including big cuts to Medicare, Medicaid and Social Security, but also defense spending. He also supports legalizing marijuana, expanding legal immigration and legalizing civil unions for gays and lesbians. FHQ is of a mind that Ron Paul has a better chance of being the Ron Paul of 2012. Johnson would likely get a pretty good look from the Libertarians and appear on their line in November 2012. That's a second order question at the moment. First Ron Paul and then Gary Johnson. Ballot Access News has the highlights and FHQ will have a broad overview either Sunday night or Monday morning. BAN seems to think that state legislatures will fall in line next year and pass laws complying with both parties' rules since they largely coincide now. Richard Winger used the word "likely" to describe state legislative action. FHQ is and has always been of the opinion that overlapping rules between the parties is a good first step in that direction, but passing election law modifications is far from a certainty. As I have maintained, all it takes is one state to derail the best of intentions. And the parties should be commended for working together. It was a necessary and sensible move. The next series of updates are for candidates with only three polls (or less) conducted in hypothetical 2012 general election match ups against President Obama. As such, the trend analyses for Tim Pawlenty, Ron Paul and Jeb Bush are more susceptible to wild fluctuations given the relatively scant level of data available compared to the four candidates (Gingrich, Huckabee, Palin and Romney) covered thus far. These are clearly cases where other variables -- presidential approval and state of the economy -- may be helpful in balancing out polls like the Politico internet poll. In the midst of many other polls, that survey merely appears as an outlier. It is still an outlier for a candidate with just a few polls against Obama, but in such a case, it serves as a distinct statistical anchor. In such cases, the straight average "feels" more trustworthy for the three candidates with more than one survey conducted against Obama. That is true for Tim Pawlenty. The Politico survey underestimates both Obama's and Pawlenty's shares of poll respondents given the other data available. It is difficult to fathom, for instance, either Obama below 40% support or Pawlenty, despite a lack of national name recognition, mustering just more than 20% support. Now, to be completely honest, a simple average is just as susceptible to outliers, but the numbers for Obama are much closer to the range in which they lie against the Big Four prospective Republican candidates. Similarly, Pawlenty's numbers, while still low, are at least closer the level of support an unknown, yet named, Republican candidate. More than anything, this may have been what spurred Pawlenty and his inner circle to produce and release the video FHQ mentioned on Thursday. The timing was a bit abnormal, but the intent is clear, despite nary a mention of a presidential race or 2012. 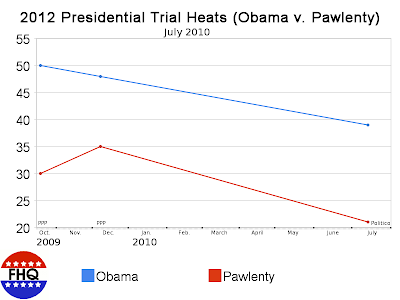 And hopefully, it will serve as an impetus for other polling outlets to include Pawlenty in future surveys. Political junkies thinking of 2012 can hope so at least. Trips to Iowa certainly aren't hurting those chances either. And they're off!!! Next Stop 2012. FHQ has often said of the 2012 Republican presidential nomination aspirants that they are running for 2012, but have simultaneously wondered if some or all would actually be running in 2012. Well, Tim Pawlenty has turned whispers and political junkie wonderings into an overt running for 2012 with his new Freedom First PAC video. We often talk around these parts about the frontloading of presidential primaries and caucuses, but the candidates do it too. I can't think of anything happening earlier in a given presidential cycle since Michigan and Arizona held first step caucuses in 1986 with 1988's GOP nomination in mind. This pre-dates even those moves. Look, neither Pawlenty nor the video say anything about 2012. However, this is an introduction. This is an action taken with something higher than merely fundraising for congressional and gubernatorial candidates as impetus. Normally, I'd shrug something like this off; especially given that it is happening during the usually (media) dead months of summer. This is the time of Gary Condit and shark attacks, not subtle presidential introductions. Yet, this is clever. It has been timed to make a splash but to do so so as to not overlap with the most intense part of the midterm election campaign. It is also timed to get someone who had less name recognition than the balloon boy to get his name out there before an actual announcement that could get lost amongst the bigger names early next year when the expected announcements will likely come. There's a long way to go until 2012, and this may all be for naught. At the very least, though, it has given those of us who follow such things, something to talk about. 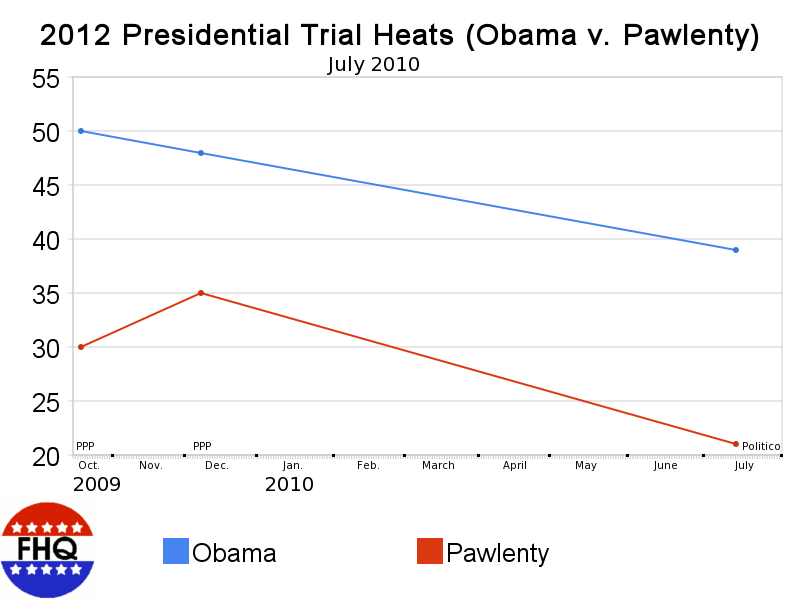 Speaking of Pawlenty, FHQ will have a 2012 trial heat poll update for him later. The last of the Big Four routinely brought up the rear in terms of performance against Obama relative to the other three (Huckabee, Palin and Romney) during 2009. So far behind did the former speaker lag that Public Policy Polling dropped him from consideration. However, the Georgian did so well in some of the surveys of early primary/caucus states that they brought him back in 2010. Not unlike the other three, Gingrich has seen President Obama's support dry up in these monthly glimpses into the state of the 2012 race. 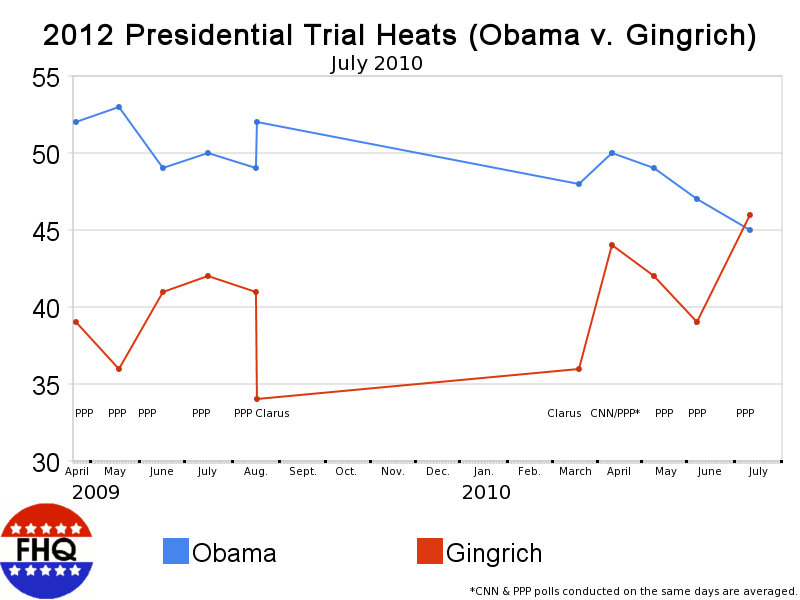 But it isn't all about Obama trailing off; Gingrich has crept up as well. His polling average is right on 40%, but his time-adjusted estimate brings the former speaker closer to Obama. Gingrich does not fare as well as Huckabee or Romney, but bests Palin against Obama. He settles in just in between both extremes. What is lacking on Gingrich is that there are fewer polls and that PPP surveys make up three-quarters of the data on him. Now, to be fair, PPP makes up the majority of all the candidates' data, but some more variation would likely be helpful. 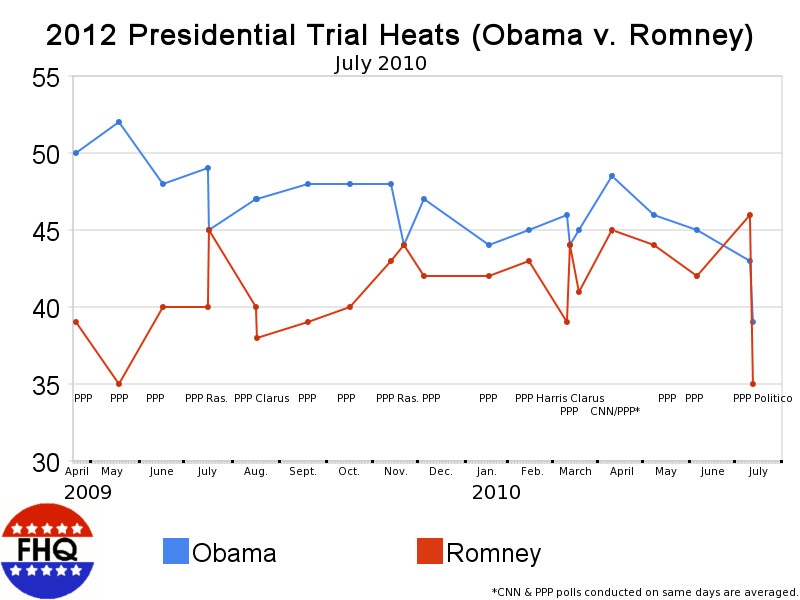 As with the other candidates*, most of the non-PPP polls show Obama with a larger lead. Rasmussen is the exception. But Rasmussen has not asked the Gingrich question yet. Perhaps that will change as we near 2011 and the time when presidential announcements begin to be made. *This seems to hurt Palin the most. She is the candidate most often polled against Obama by other polling firms. Among the four candidate who are surveyed most frequently in hypothetical 2012 general election match ups against President Obama, Mitt Romney does the best. [Yes, that spoils the Gingrich results on some level, but so be it.] The former Massachusetts governor's numbers are on par with Mike Huckabee's as measured by both the straight average of polls conducted and the regression trend estimate, but Romney actually leads Obama in the latter -- the only candidate to do so. While Romney tended to keep Obama's level of support at low levels as compared to most of the other Republicans polled, the 2008 presidential candidate also failed to muster much support of his own during the first half on 2009. Since July of last year, though, Romney has fared far better against Obama compared to the other Republicans across a variety of polling houses. That consistency across polls has boosted Romney, whereas his closest competitor -- at least by our measure -- Mike Huckabee has been very consistent in the Public Policy Polling surveys while lagging in other polls. Again, that speaks toward Romney's inching upward more than it speaks to Huckabee falling. For all intents and purposes, the two hold a very similar position in relation to Obama in a potential general election race. Romney has some establishment support within the Republican Party, perhaps even similar to what McCain enjoyed in 2008. However, Romney looked good heading into the 2008 primary season too only to fall by the wayside once McCain was able to string together victories in New Hampshire, South Carolina and Florida heading into the pivotal Super Tuesday states. He will have to show a lot of establishment support if he wants to avoid that fate again. I won't dwell on these results. More than anything, they simply maintain the status quo: Romney looks good in New Hampshire. Ho hum. However, I will add one note of caution. This was a survey of Republican voters in the Granite state. It does not in any way account for the mass of independents that will surely participate in the Republican primary with Democrats idle in 2012. The argument could be made that Romney would benefit even more from the inclusion of independents. Yet, New Hampshire primary voters have been known to be, oh, I don't want to say quirky, but willing to take a flyer on someone other than the frontrunner. While there is no definitive frontrunner for the Republican nomination at this point, Romney is the New Hampshire frontrunner and that gains him some points in laying claim to that tag at the national level. 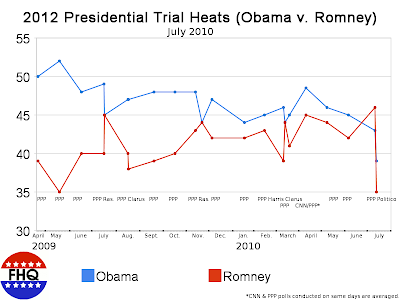 Speaking of Romney, FHQ will have an update -- with graphics -- of his trial heat numbers against Obama later today.